By Gordon Frickers 40 x 61 cms (16″ x 24″), Original Sold, a few copies left available as a signed print. A typical Atlantic Ocean Convoy towards the end of World War 2. 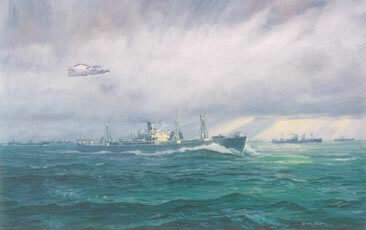 Protected by a Catalina flying boat, on anti U Boat patrol, this painting produced on speculation shows a typical WWII convoy entirely composed of American built Liberty class ships. American Liberty ships came to be the largest single class of merchant ships ever built. Their existence significantly shortened the war. Here we see different types including examples of the T Class tankers, troop carriers, army hospital ships and of course cargo carrying all purpose go anywhere “tramps”. The Liberty ships were a development of a British design, built in the USA as replacements for the heavy losses, these fine ships proved very popular with their crews. It was considered, if they survived one voyage they had paid for themselves. To learn more of this painting try our “Further Reading“. This painting was last seen in the offices of Western Power Marine at the old flying boat station, Mount Batten, Plymouth, Devon from where in former times Catalina and Sunderland flying boats were operated on Atlantic and Biscay bay patrols..